Paige is one of our incredibly talented bakers, and when she came up with this salted caramel recipe, I knew we had to make it the hero of our next cake of the month. Cue, our Salted Caramel, Date and Pecan cake, which I have to say, is up there with one of the best Caker menu cakes yet. The caramel sauce, which is not only in the cake batter, in the icing, AND drizzled on top, is so freaking delicious, it's hard to resist temptation to eat it with a spoon when it's being freshly made. Not to mention the smell in the kitchen is highly distracting. I wanted to share the recipe so you can make it at home and experience the insanity! Pair it with your own baking creations or simply pour over some vanilla ice cream for a sneaky treat. 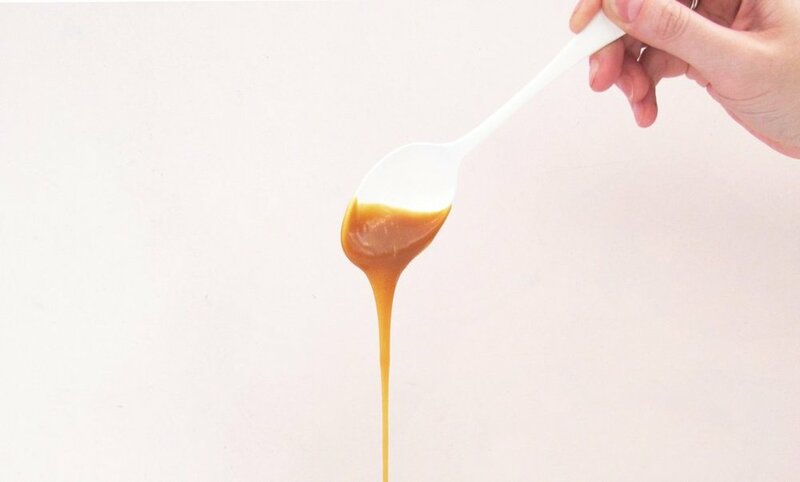 As this is a dry caramel recipe, you don't need to brush the edges of your pan to prevent the sugar crystallising, making this recipe so much easier to whip up at home. In a large pan, pour half of the sugar into the pan and turn on to a medium-high heat. Melt while stirring occasionally, and then sprinkle over the rest of your sugar and continue to melt. Keep an eye on it, while stirring occasionally, and as soon as the sugar is an amber colour, whisk in the butter. Once the butter is fully incorporated, turn off the heat and slowly stir in your cream, be careful as it will bubble! When the mixture has come together, it will have a smooth, thickened consistency. Whisk in the flaky sea salt to finish. Refrigerate for up to two weeks and stir before use if the sea salt has settled. Pro tip: Boil water in your pan to help the cleanup! Use equal parts coconut cream and brown sugar (1 cup each should do it! ), add to a pot and boil gently on a medium-high heat (stirring occasionally) until a thick consistency is reached. You can add a small pinch of flakey sea salt to this as well, if desired.